Siphonic Closets have found favour in recent years, and have all the advantages of the washdown form with greater rapidity of flush and less noise in action, but they are somewhat more costly. A good type of this closet is Messrs. Jennings & Morley's (see Fig. 199). The water area is 12 by 10 inches, and the trap has a 3-inch seal. The incoming water expels the air through the pipe K and starts the syphonic action. 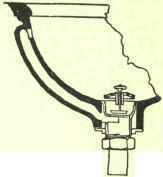 The pipe J admits the air to the long syphonic leg R, and prevents the siphonage of the basin when slops are poured into it. There are two connections from the service to the closet, one into the basin and the other into the long leg of the syphon R. This type of closet is much used in America. Doulton's pattern is shown in Fig. 200, and Davis & Bennett's in Fig. 201. Closets are also made with thigh rests - that is, slips of hard wood inserted into the earthenware pan. These are more cleanly than wood seats, and are suit-able for use in schools, and barracks. Trough Closets are used in factories, schools, and barracks, but not now so frequently as formerly. The closet is flushed out by an automatic flush tank, which should hold enough water to completely flush the trough. It has been found, however, that the faeces collect at the back of the trough where the flush does not remove them. The late School Board for London substituted for the closets the washdown, which have been found to be almost as economical as regards the water used. Automatic Flushing Closets of the washdown type are sometimes used in public buildings, the syphon being started by the moving of the seat when the user rises, or, by means of opening and shutting the door. Water- Waste Preventers are used on all washdown closets and urinals. There are many varieties on the market. The regulations of Water Companies, as a rule, restrict these to a 2-gallon flush, but a 3-gallon flush is preferable, and should be used where possible. 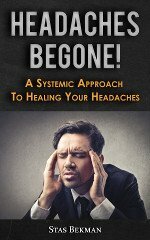 Those acting on the syphonic principle, with a single pull and let-go, are the best. On the other hand, those requiring the chain to be held until the cistern is discharged should be avoided. The illustration (Fig. 202) shows a Doulton's "Paisley," which, like many others, has proved very satisfactory in practice. 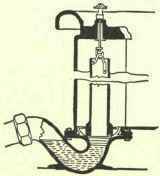 The chain is pulled and lifts the disc in the chamber marked A, forcing the water over the bend, and forming a vacuum which starts the syphon. The cistern empties, and then refills to its. normal level. This type is really a water-waste preventer, because the water must discharge out of the overflow should any of the fittings go wrong. The inlet and the overflow should be the same size, namely, \ inch, so that they can be changed if the cistern is not the right hand. The junction between the cistern and the supply to basin should be \\ inch, either in brass, lead, or iron; and the junction to the pan can be made either to a vertical inlet to pan by means of cement, or to a horizontal inlet by means of a rubber cone, or a screwed flange connection. The overflow from the cistern, which should always be 25 to 50 per cent, larger than the inlet (unless they be interchangeable), should be taken through the wall, and finished on the end with a copper flap. Baths are made of copper, enamelled iron, or porcelain. They should not be cased in, but left open, so that they can be easily cleaned. Porcelain baths are very cleanly, and are now much used, but they absorb a great deal of heat from the water, and are heavy and costly. Fig. 203 shows an enamelled cast-iron bath with a rolled edge, the standing waste acting as an overflow, a detail of which is shown by Fig. 204. This obviates the necessity of discharging the overflow on to the lead safe, and consequent sloppy mess in the bathroom. An antisiphonage pipe should be taken off the trap and carried through the wall with a brass grid soldered into it, or it can be connected to another antisiphonage pipe, if one is near. Most authorities make the taps to discharge above the water-line, but it is preferable to discharge them below, and prevent the room being filled with steam. 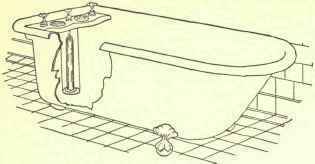 The supply pipes to the bath should be 3/4 inch downstairs and 1 inch upstairs, but this greatly depends on the head and hardness of the water available. The taps should always be of the screw-down type. (b) The ordinary basin and plug. Many prefer the first-named, as the basin is emptied more quickly. The under basin into which the water is thrown must be frequently cleansed to prevent its becoming a nuisance. Fig. 205 shows a range of ordinary lavatory basins with their plumbing. They may be in the form as shown on Fig. 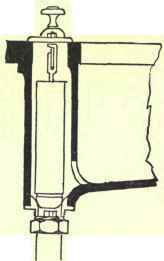 206, or with a concealed (Fig. 207) or open standing waste. Fig. 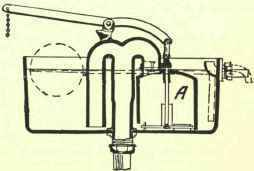 205 shows the manner in which each basin is trapped and the way the antisiphonage pipe is arranged, the trap being of the anti-D type. The junction between the waste and the lead pipe is made by a brass cap and fly nut, as shown by Fig. 208. The lead trap is connected to the lead waste by a wiped joint.